“There’s a great woman behind every idiot,” said John Lennon, as a version of the famous expression, “Behind every great man, there’s a great woman.” But who were the women behind The Beatles? 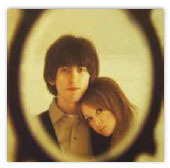 The Beatles’ wives, partners and girlfriends. One of the most famous Beatles’ wives is avant-garde artist Yoko Ono, John Lennon’s partner. John once described her as “the world’s most famous unknown artist: everybody knows her name, but nobody knows what she does.” John met Yoko while he was still married to Cynthia Lennon. 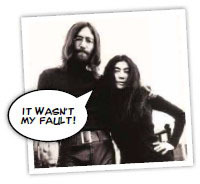 After the separation with Cynthia, John married Yoko in 1969. Many fans blame Yoko for the Beatles dissolution as she was present at many of the band’s recording sessions – something the group had previously decided was forbidden. Later, John and Yoko had a son together, Sean Lennon, who is now a musician and actor. Before meeting John, Yoko was already a famous artist, with a particular interest in conceptual andperformance art. An example of this is Cut Piece, which was irst performed in 1964 at the Sogetsu Art Center in Tokyo. As part of the work of art, Yoko walked on stage and knelt on the loor. She had a garment draped over her, and members of the audience were invited to come onto the stage to cut of bits of the material. Great news! 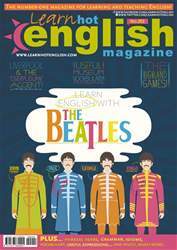 The latest issue of Hot English (202) is out now! Learn over 1,000 useful words and expressions and improve your listening skills with Learn Hot English! This month: learn English with the Beatles. Read over some famous Beatles lyrics and learn lots of useful English at the same time. Plus, 10useful words and expressions for talking about bathroom accessories, 10 useful words for talking about museums, idioms, phrasal verbs... plus: • Jokes – jokes in English. • Lawsuits – some ridiculous lawsuits. • Grammar – the Present Continuous. • Travel – the Highland Games. Culture – the pub quiz. Language – how to learn by writing. Music – the Beatles. Health – walking. Art – investing in art. Psychology – mnemonics. Politics – whistleblowers. AND LOTS, LOTS MORE! By reading and listening to all this great content, you'll improve your English reading and listening skills and learn up to 1,000 useful words or expressions. Plus, you'll get a better job and pass English-language exams more easily. Guaranteed! Scottish music and culture at the highland Games! The pros and cons of investing in art! Telling the truth – famous whistleblowers!